A brief introduction 'for gamers' sets out the way this book has been approached, in the main it's written as a travel journal, the sort of thing you might consult if intending to go there, with game stuff - plot ideas, mechanics, etc - confined to sidebars and separate sections. 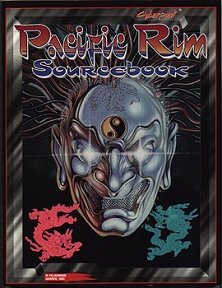 The idea is that the material here should empower you to run adventures in the Pacific Rim - the far east of China, Japan, etc., Indochina, Indonesia, the Philippines, or right down to Australia and New Zealand - or have characters who come from there, wherever it is that they are now adventuring. Then we get the travel magazine introduction, all delivered in character and explaining some of the basics like how names work in different nations and what currencies are used and how much your Eurobucks are worth. There are also notes on how similar cultures are to one another and about driving - and about the ease (or otherwise) of using cyberweapons when driving on what, to you, is the 'wrong' side of the road! We then dive straight into the Japan section, starting with a map and some background and culture. Despite being renowed for corporations, it is still an Empire. It's also one of the biggest consumers of cyberwear. Due to a period of assassinations in the early years of the 21st century, the throne is now occupied by a 13-year-old girl, with a regent in place and - due to family connections - Arasaka troops supplementing the Imperial Guard. There's a timeline from 1992 to the present (2020), and notes on religion (Shinto, respect for the dead, especially dead heroes) and how the country got its name. Urban attitudes, recent political history and current affairs, and how corporations and government work together... and we meet some of the leading corporations. There is material on the Self Defence Force (SDF) - technically Japan doesn't have armed forces - including all the details necessary to make a character who has served, or is serving, in the SDF. Then we hear about Japanese police and the draconian weapons laws, along with notes for creating cop NPCs, before moving on to Japanese gang culture. Then there's a more in-depth look at Tokyo. Apparently a major bridge has gone rogue. It's controlled by an AI, you see, and that has developed a wayward streak that hasn't been brought back under control - it uses drones and point-defence systems to keep those it doesn't like away! There are brief notes on Osaka and Kyoto as well; and the section ends with how different roles fare in Japan, and a whole bunch of atmospheric LifePath material for Japanese-born characters. The next chapter deals with United Korea. Well, the rest of the world may be going to hell in a handcart, but unlike the real world, North and South Korea have reunited. Tensions remain in a land where cybertech is frowned upon, a very male-dominated society where women are treated as chattels and breeding stock - of course, many of them disagree with this role and are doing something about it. A lot of this is explained in a fascinating 'interview' with Mrs Sun UnSuk, the head of Sungan Zaibatsu, which explains a lot of Korean culture and mindset. There's also a timeline, and even a character sheet for Sun UnSuk in case she pops up in one of your adventures. There's a detailed look at Seoul, the capital and home to ten million people, and notes on leading Zaibatsus, the Korean answer to corporations. An outline of the political situation presents a place dominated by corruption and nepotism despite ostensibly being a presidential parliamentary democracy. Focus then moves to the Korean military and law enforcement. As all Koreans do military service when young, it's likely that any Korean character will have served and a few notes cover this. The police are actually military in nature, and virtually incorruptable. Details of making a Military Police character are also included. Next up is China, with a timeline and notes on the confusing class system within a classless society. Anyone who is not Chinese will stand out like a sore thumb, and anyone who is of Chinese heritage will be expected to speak the language. The importance of maintaining 'face', avoiding the number four and mutual gift-giving (which you don't accept at first offering so as not to appear greedy) are also covered. Get some business cards with your name and a flowery description of your profession in both English and Chinese. Most people are very superstitious. Main forms of transport are trains, bicyles and feet. It's still Communist, and very beaurocratic, so dealing with the government is frustratingly slow and difficult. It's a police state, and you need official permission to do just about anything. Few people have access to weapons or cyberwear. They still use the Yuan as currency, with paper notes rather than credchips... and the black market is huge. Everybody uses it at least occasionally. There's some history - quite a brief overview given how long China's history is! - and notes on the various gangs to watch out for and avoid. The main organised crime gangs as the Triads. Geography is covered sketchily in a series of thumbnail sketches, given that China is such a big country. Beijung, Shanghai and Hong King are described in a little more detail. Civil war has done a lot of damage wherever you go, although everything is peaceful now. Interestingly, after the British left Hong Kong the Ghurkas developed into an independent mercenary group. There's a fair bit about the Chinese military and Public Security (that's the police). And Taiwan? Still independent, capitalist to the hilt, beaurocratic, armed to the teeth. No change there. Finally there's a round-up of how different roles operate in China along with revised Lifepaths if you fancy playing one. The next port of call (several, really) is Southeast Asia. This covers Indochina, the Philippines, Malaysia and all the islands between the Asian mainland and Australia. The timeline mostly talks about how world events affected the nations here, although the Philippines appear to have gone through presidents like nobody's business - one was killed and his successor was also sent to meet his Maker on the way to his inauguration! Ancient nations, yet ones long accustomed to dealing with Europeans since colonial days, they have their own trading bloc which remains just that, unlike the European Community, whom they distrust. They also keep wary eyes on China and Japan. It's hot and humid most of the time, with a rainy season and a tendency to typhoons. Cultures differ by island, but tend to be Chinese or Malay based, then there's an added layer of faith - Buddhist or Islamic. Since the Mid-East Meltdown, there's been an influx of Muslims from the Middle East. Most nations, however, don't like the generally scruffy cyberpunk style so visitors are warned to be careful about their appearance. Singapore even has dress codes enshrined in legislation! Many nations have internal unrest, and all who rely on fishing or tourist beaches have been blighted by a massive oil spill. There's a survey of the different nations to highlight various salient points, an overview and notes on economy and government. Everythings scattered with commentary from various individuals, information on notable individuals, and often a few words of local slang. Again, the section ends with notes on how the various roles play out in the area, and Lifepath notes. Then we come to Australasia, consisting of Australia and New Zealand. Australia became a federal republic in 2001 after the fall of the UK monarchy. Western Australia promptly left the Federation, but the rest of Australia refused to recognise this. They are sports fanatics, preferring Australian Rules Football (usually called footy) in which cyberwear is forbidden. There is a cyberware variant league however. Beer is also vital to Australian culture, and they are not interested in substitutes or even foreign 'real' beers. Australia used to be a textbook for racial/cultural integration, at least of immigrants. The aboriginals would disagree. Poverty since 1994 has divided the country often on racial lines. There's a survey across the states, complete with several overt adventure hooks, and after some Aussie slang, New Zealand gets the same treatment. Then there's the usual role-specific information and Lifepath modifications. There's a lot packed in here but if you want to take your adventures to this region or have a character come from there, it will prove invaluable. Return to Pacific Rim Sourcebook page.